As a new year dawns, the waters of the Mekong River remain turbulent with uncertainty. While many take holidays and prepare for the new year, the people of the Mekong face an unknown future. Earlier this month, residents along the Mekong in Chiang Rai were preparing to participate in a public hearing about a project to canalise the Lancang-Mekong, popularly known as the Mekong “rapids-blasting” project. The Chiang Khong Conservation Group, a local environmental organisation, was informed by the Marine Department that eight hearings would be organised in districts along the Mekong in Chiang Rai from December 12-18. However, just one day before the meetings were due to begin, the group received a letter advising that the hearings would be postponed indefinitely. Just at the new year, an announcement was made that the hearings would be during this week (3-5 January). The sudden change of plans took the community group by surprise. This latest twist follows a pattern of contradictory statements regarding the plans for the rapids-blasting project. Nearly two decades ago, China, Myanmar, Laos and Thailand signed the Agreement on Commercial Navigation on the Lancang-Mekong River. The agreement aims to enable navigation of 500-tonne freighters between southern China’s Yunnan to the Thai-Lao border and on to Luang Prabang. The agreement has provided a basis for proposals for canalisation of rapids to enable year-round traffic of commercial barges. Under this plan, the Mekong would eventually be converted into a waterway for commercial navigation. The project has already been implemented along Myanmar-Laos border, up to the Thai border at the Golden Triangle. For Thai communities, the plans raise grave concerns over the threat to the river ecosystem, critical fish habitat and breeding grounds, and local livelihoods. The proposed canalisation in Thailand was suspended for more than 10 years by previous Thai governments. Major concerns were the project’s environmental impacts and issues of national security and sovereignty at the Thai-Lao border. Then, in late 2016, the developer, China CCCC Second Harbor, requested to meet the Chiang Khong Conservation Group and proposed to share information about the Mekong canalisation project, indicating that it had been revived. Within days of the meeting, the Thai Cabinet adopted a resolution supporting the plans for “survey and design”. This was a highly unexpected decision and a huge shock to the Mekong communities of Chiang Rai. 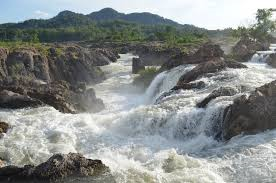 Following a sustained campaign by local communities, in late 2017, Foreign Minister Don Pramudwina, after attending the 3rd Mekong-Lancang Foreign Ministers’ Meeting in Yunnan in December, announced that China had decided to step back from its plan for rapids blasting. The minister reported that the Chinese government acknowledged that the rapid blasting project would hurt communities living along the river. He called it a “New Year’s gift” for Thai people. But the recently announced hearings, while currently postponed, reveal that the project is still very much alive and is expected to move forward. The years of suspensions and contradictory announcements continue, and create a prolonged sense of uncertainty for local communities fighting to conserve the character and rich resources of their river. The question remains, why is the Mekong-rapids blasting project still being pushed forward, despite the previous suspensions and contrary statements? The Mekong in Chiang Rai has already experienced severe ecological devastation in recent years due to dam construction on the river’s upper reaches in China. At least 10 dams have been completed on the Lancang, or upper Mekong, with the Jinghong Dam closest to the Thai border, 340 kilometres away. Three more Mekong dams are slated for construction in neighbouring Laos, including the Pak Beng dam, proposed for development by a Chinese company in Oudomxay, just 90 kilometres from the Thai border. Plans for Pak Beng dam include navigation locks to enable passage of commercial barges downstream. Looking at the bigger picture, the canalisation proposal can therefore be seen in the context of a much larger plan for the river, converting it from a watershed with fast-flowing rapids to a waterway and powershed in the form of a series of reservoirs and canals – producing energy and profit while facilitating increased cross-border trade and commercial activity. The Chinese developer of Pak Beng dam has also tried to engage Thai communities campaigning on the project’s adverse environmental impacts. In late 2017, Pak Beng project developer, Datang Corporation, contacted the Chiang Khong Group and asked for a meeting to share information about the proposed dam. A meeting took place in Chiang Khong in January, followed by a technical consultation in November convened at Chiang Mai University. During the meeting, the Network of Thai People in Eight Mekong Provinces proposed that a new transboundary impact assessment be carried out to reassess its ecological impacts, and the likelihood of extensive damage to fishing, culture, livelihoods and natural resources in the Mekong. The Mekong River Commission has found that the existing study for the Pak Beng dam is seriously flawed, based on outdated data. The company is yet to respond to this proposal. As a Mekong dweller who has been working to protect the river for two decades, I foresee major concern over the impacts of projects being pushed forward and confusion and fear as people await the next development. Millions of people are watching as the Chinese companies developing these projects try to engage local people in meetings and dialogue. These attempts could be attributed to political considerations, as China looks to increase influence downstream through the auspices of the Lancang-Mekong Cooperation framework, a miniature of the ambitious Belt and Road Initiative, which has raised major environmental concerns globally. They could also be explained by legal obligations, with Chinese laws increasing in stringency with regard to the adverse environmental impacts of investments abroad. But approaching people of the lower Mekong simply to inform them about incoming projects is meaningless unless it involves real dialogue based on a mutual understanding that we treat the Mekong River as a shared resource. Also critical to meaningful dialogue is acknowledgement by Mekong states of the damage that is already being inflicted on the river due to dam construction, canalisation and other developments. So far, political will has not been forthcoming in exploring collective solutions among the states. Instead, governments appear busy serving the vested interests of the private sector, at times with a reckless disregard for environmental and social costs. In his visit to Laos earlier this month, Prime Minister Prayut Chan-o-cha discussed the purchase of cheap power from Laos, almost all of which will be generated by dams on the Mekong and its tributaries, with severe environmental impacts on the river system. At the same time, Thailand is enjoying an unprecedented power glut, and alternative renewable energy technologies are increasingly feasible and cost-competitive. As we turn the page on a new year, the voice of Mekong communities must be heard: by governments, developers and investors. Do we really need to exploit priceless natural resources for today’s profit without regard to the irreversible consequences – for the river and for current and future generations? Pianporn Deetes is Thailand and Myanmar campaigns director with International Rivers, a global NGO working to defend the rights of rivers and communities. Since 2002, she has worked to protect Southeast Asia’s major rivers, the Mekong and Salween.